This is a long story, sort of, with multiple parts. And it is not finished yet, but it is closer. It started over a year ago. My daughter and then future son-in-law were planning a wedding. They had registered for all of the usual things, fine china, flatware, crystal, stoneware and I was interested in getting them something special. In talking with the bride she mentioned that the groom had an interest in a decanter but they hadn't found the one that they loved so it was not on their registry. I set about searching for a vintage one, sending pictures to my daughter of the occasional one that I ran across. None were perfect. At the same time I had been picking up vintage glass in a pattern called Wexford. My other daughter had bought some glasses and the pattern was pretty distinctive and I started seeing it on thrifting outings with my sister and bought the first few pieces thinking that they would supplement her collection. I don't know if it is a midwestern thing but I started finding it everywhere, fell in love with it myself and now my collection is larger than hers. 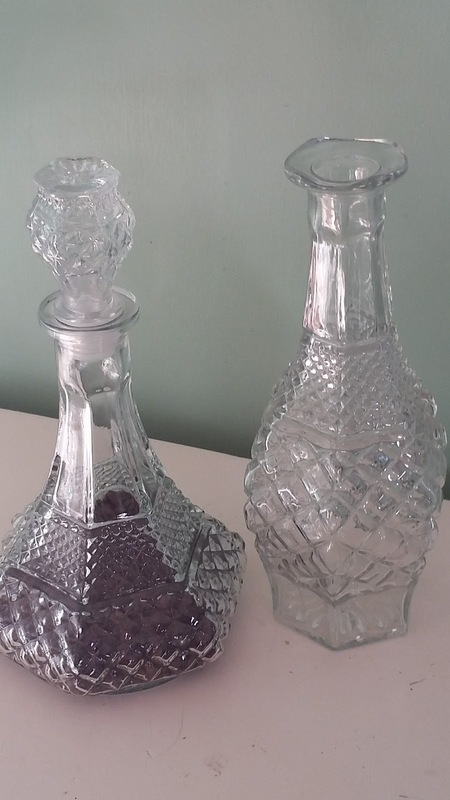 This summer I found two of the Wexford decanters and added them to my collection. I did break the stopper to the one decanter but it didn't fit well and it fell off when I was carrying it so I wonder now if at some point it been substituted for the correct one prior to my purchase. 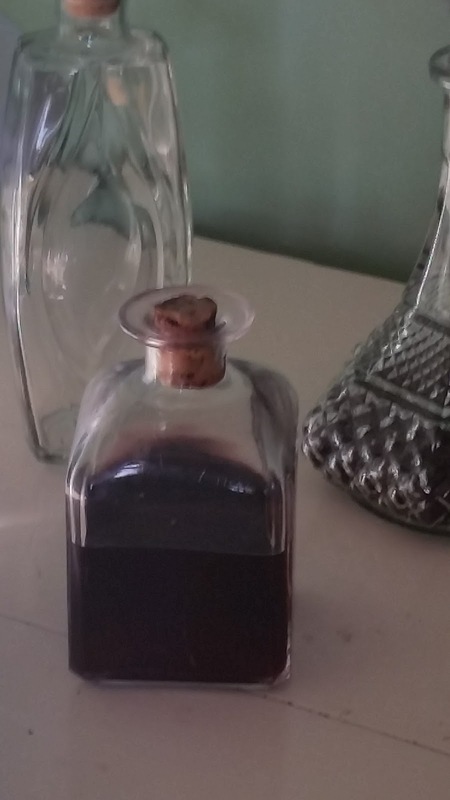 I also found this little decanter that I hoped would hold small amounts of homemade elderberry cordial that I had steeping. Then, just recently I discovered a blog through a link party that I had not read before. Not sure how it had evaded my radar as the archives go back several years but I am so glad to have found it. And last week Helen, the blog's author, shared a drool worthy picture of her bar cart. 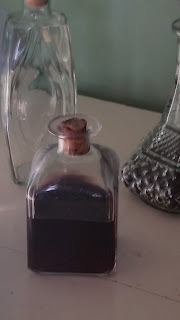 She had written about how her husband was collecting decanters. Each of their decanters was different and I loved the look and it changed my perspective. I no longer was only on the lookout for Wexford decanters but would instead consider any that were interesting and fun. Now, I have to admit that the idea of a bar cart for me is probably foolish. I live alone. I do not entertain often. My kids are grown and live across the state with busy lives so we get together less than I would like. But I want one. Then, my favorite shop, a mix of thrift store and antique store, that specializes in estates, decided to move to another town. They were having a sale, deeply discounting their inventory. My sister and I decided to make probably our last trip to the store before they closed. They had lots of stuff that they were selling that had not previously made it to their sales floor. 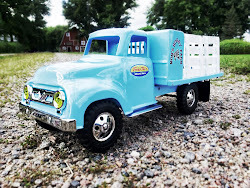 They would box up an estate, haul it to the shop, store the boxes in the basement and unload the boxes as space allowed. They had six decanters. And I grabbed them up. Some of them still had old price tags on them so I think that they were probably collected over time and then the collection ended up as part of an estate. In the blink of an eye I was a whole bunch closer to Helen's bar cart. Yay! To finish up this story. I ended up choosing a different gift as a wedding gift for the bride and groom. 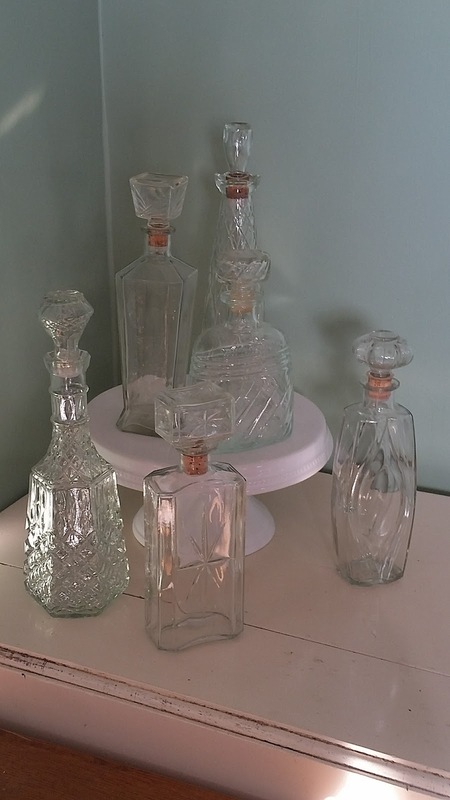 I continued to share pictures of new and vintage decanters with my daughter and this fall an online catalog that I received as an email had a new decanter that they liked and purchased. I now am going to keep my eye out for a bar cart to hold my new collection. And plan a cocktail party next time the kids are home. I will be joining BNOTP for Met Monday here. I know, lots of archives to poke through.